Toyota introduced the first generation of the Prius in the United States in mid-2000, the second generation for model year 2004, and the newest model, the third generation, last year as a 2010 model. Prices begin at $22,800. This one, as expected, is the best one yet. It has EPA ratings of 51 mpg city/48 highway versus 48 city/45 highway for the previous generation. My first-generation Prius, which I owned until about six months ago, usually averaged about 42 mpg in everyday use, which was a mixture of city and highway driving.The Prius continues to feature a full-hybrid system, which allows the car to run on either the electric motor or the gasoline engine, or a combination of the two. The nickel-metal-hydride battery pack, under the rear seat, recharges while the gasoline engine is running or the car is decelerating. The new Insight hatchback has a base price of $19,800, making it the lowest-priced hybrid in the U.S. market. That price is for the entry-level LX model. The uplevel EX model lists for $21,300, and the EX with a satellite navigation system will sell for $23,100. Official EPA ratings are 40 city/43 highway, achieved using a combination of a four-cylinder gasoline engine with intelligent variable valve timing and an electric motor. 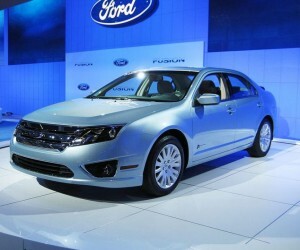 The Ford Fusion Hybrid sedan is new for 2010. It has a clone in the Mercury brand, known as the Milan. EPA ratings are 41 city/36 highway for both. A Lincoln version is on the way for model year 2011, using the same technology and getting the same fuel economy. It's the MKZ Hybrid, and it will have more standard amenities than the Ford and Mercury versions. The Fusion Hybrid begins at $27,950, while the Milan Hybrid lists for $28,180. The 2010 Volkswagen Golf TDI (which stands for “turbo-diesel injection) is a three- or five-door hatchback and has no electric motor, just a very-efficient four-cylinder clean diesel that achieves EPA ratings of 30 city/42 highway. Prices begin at $22,155 for the three-door version and $22,760 for the five-door model. The Mini Cooper has neither an electric motor nor a diesel engine — just a gasoline engine that gives us 28 mpg city/37 highway. Besides the great fuel economy, this is a cute and fun little car with a surprising amount of space for the front-seat occupants. Even tall people fit easily into this car, which begins at $18,800. The Ford Escape Hybrid has a drive system quite similar to the one in the Fusion Hybrid. In this instance, though, the vehicle is a compact crossover, rather than a sedan. There is a Mercury version of this as well — the Mariner Hybrid. EPA fuel economy for both is 34 city/31 highway. Prices for the Escape Hybrid begin at $29,860 and for the Mariner Hybrid at $30,105. Honda Fit is a subcompact that is neither a hybrid nor a diesel. It has a small gasoline engine that gives it EPA ratings of 28 city/35 highway with the five-speed automatic transmission or 27/33 with the five-speed manual. It's actually a fun little car to drive and has a starting price of $14,900. The BMW 335d sedan comes with a six-cylinder diesel engine and EPA ratings of 23 city/36 highway. It's not cheap, though. As a BMW luxury car, it carries a base price of $43,950. But it's a BMW, after all, so it will be loads of fun to drive. And that highway fuel economy is a real plus. Tthe Toyota Highlander Hybrid, a midsize crossover utility vehicle seats for up to seven people and fuel economy ratings of 27 city/25 highway. Prices begin at $34,900. Chevrolet Tahoe Hybrid is a a full-size American sport utility vehicle and offers seating for up to eight people, great trailer-towing capacity and EPA ratings of 21 city/22 highway.